Ideal for use in classrooms, playrooms, churches, recreational centers, and at home, ECR4Kids Everyday Adjustable Activity Tables provide a durable, versatile space for kids to work and play. A durable T-Mold edge banding is inserted around the tabletop to prevent wear and tear while providing a polished, professional look. 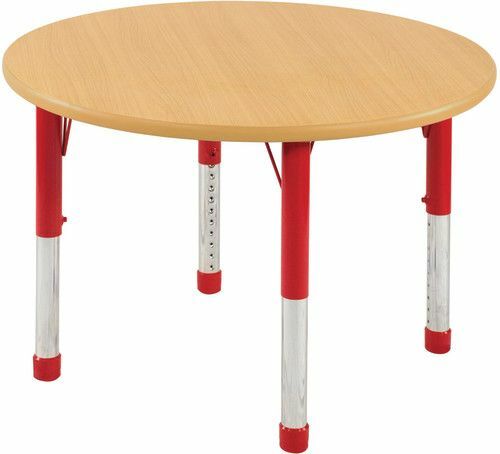 The double-sided laminate tabletop is easy to clean and sanitize between science experiments and snack time, and it features rounded edges for safety. Choose from a wide range of color and style options to achieve the ideal aesthetic for your uses. 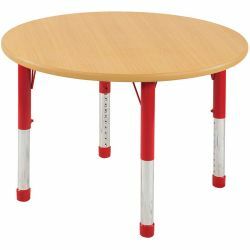 Table legs adjust in 1" increments to accommodate growing children and for use with different age groups; several sizes and styles are available. Different glide options are also available to enable use across various floor types. Upper table legs are powder-coated tubular steel, while lower legs are chrome plated for a sleek look. Matching School Stack Chairs and Contour Chairs are sold separately. ECR4Kids Adjustable Activity Tables have achieved GREENGUARD [GOLD] Certification for low chemical emissions into indoor air during product usage, meet BIFMA certifications for safety and durability, and are CPSIA-compliant for safety. With a concentration on the Pre K-12 sector, ECR4Kids offers a wide range of products including classroom tables and chairs, preschool rest time solutions, hardwood storage cases, blocks and manipulative, mobile organizers and a variety of indoor and outdoor play structures.